All the fun of the Market! 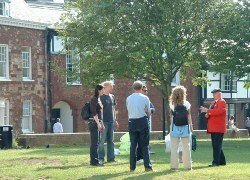 Exeter hosts many markets throughout the year at various venues within the city from car boot sales to traditional street markets. Some of these are weekly occurrences such as the farmers market held within South Street on Thursdays, others are by special arrangement with a German Christmas market held in the past. 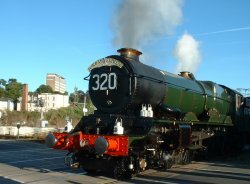 Keep a check on the Exeter Event's Calendar for listings of regular and occasional markets. A market promoting local produce held on the South Street / Fore Street corner on Thursdays from 9am to 2pm. The market offers visitors and shoppers the opportunity to chat with the producers and purchase a tasty choice of foods from meats, vegetables, poultry, pies and more. A large car boot sale attended by hundreds of 'booters' and traders is held every Sunday morning at the Matford Centre on edge of the Marsh Barton Industrial Estate. Traditional street market held on most days throughout the year except Sundays. Is the largest livestock market in Devon & Cornwall. Held at the Exeter Livestock Centre, Marsh Barton. 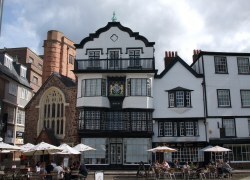 Keep a check on the ExeterViews Events & What's On Calendar for market event listings. Other markets including the Exeter & Devon Slow Market trading traditional and local food on the historic quayside, the Continental Market with its traders from various countries including France, Spain and Belgium who offered food and gifts native to their countries, and a German Christmas Market have all been held in the city in the past during the Exeter Summer and Autumn festivals and on different dates throughout the year.